Breathtaking oceanfront views and this charming Hilton Head beach home will set the tone for an unforgettable beach vacation. 123 Dune Lane has four bedrooms plus a loft with bedding, 3.5 baths, sleeps 10 guests and features a private pool, hot tub, private beach path, multiple balconies and extensive decking with panoramic views of the beach and Atlantic Ocean. The main level of the home has vaulted ceilings and extensive windows that highligh the oceanfront view. This level features the kitchen with granite counters and bar seating for four (4), dining area with seating for eight (8) and large living room with large, comfortable sofas and flat screen TV. The laundry room is behind the kitchen and provides a 2nd refrigerator and extra pantry, in addition to the full size washer and dryer. The master bedroom with King bed, flat screen TV and private oceanfront balcony is also on this level, as well as a half bath that serves the living areas. 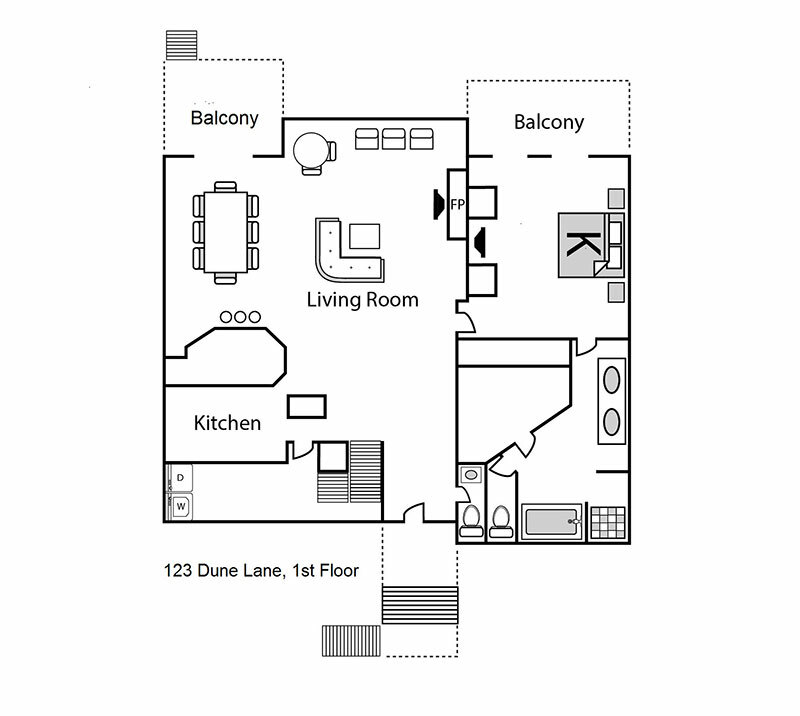 The second floor features 3 bedrooms and a loft area with bunk beds, chairs and a TV. The oceanfront guest bedroom on the left has a King bed, TV, full bath and balcony overlooking the pool and ocean. 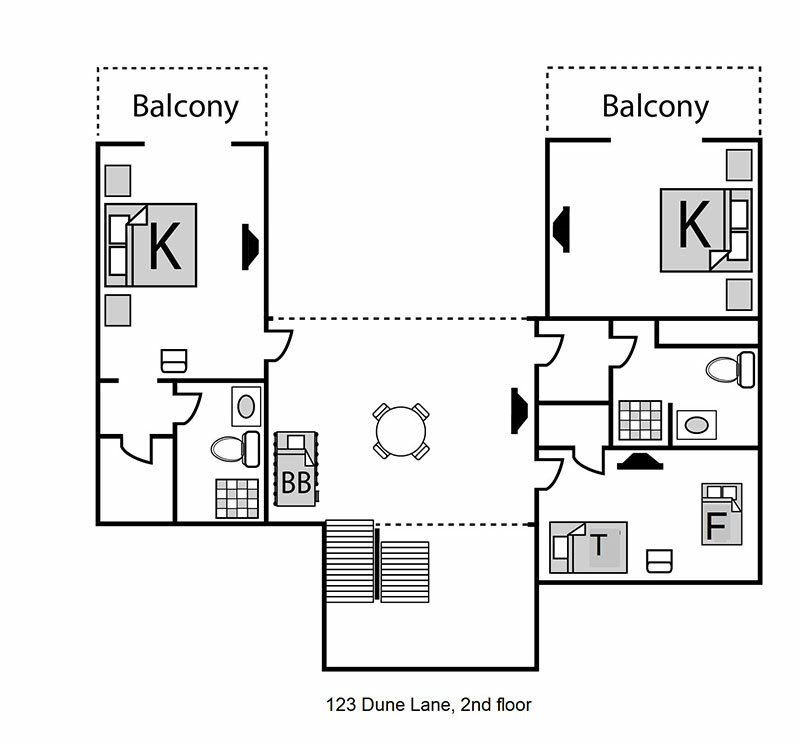 A second oceanfront guest bedroom on the right also has a King bed, TV and balcony. The third guest bedroom has 1 Twin bed and 1 Full bed and a flat screen TV, and this bedroom shares a full bath with the loft area and King oceanfront bedroom on the right. 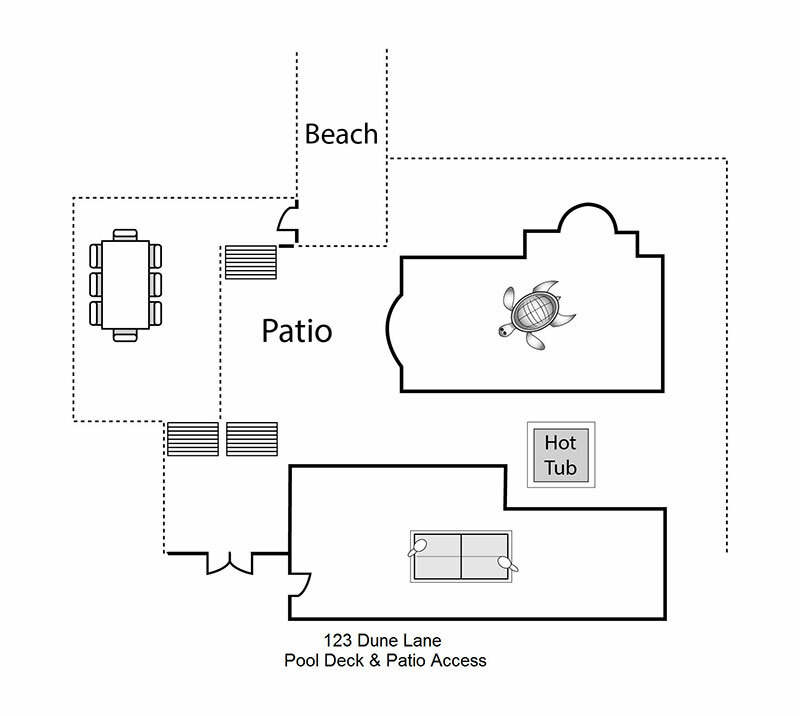 The amenities at 123 Dune Lane will take your vacation to the next level! All of the bedrooms and living areas have TVs, DVD players and wireless internet. A recreation room with separate lockable entrance has a ping pong table and enough room to safely store golf clubs, bikes, etc. And the outside amenities include a large swimming pool (can be heated for additional fee), stand-alone hot tub, gas grill, private beach path, and plenty of decking and furniture for relaxing and entertaining around the pool. Gail Edmonds was very personable and helpful answering our questions as we planned a year ago to rent 123 Dune Lane. The home was perfect for our family of ten including two 6 year olds, two 4 year olds, their parents, and Pop & I. It is beautifully decorated, comfortable, and the pool was perfect for the littles. The adults enjoyed their own king room with a private deck to view the beach and the littles love the bunk beds/loft area. The best part was the private boardwalk and just a few steps to the beach. Our family vacation was everything I hoped it would be! Thank you! The property was beautiful. All the beach and pool toys were a big bonus! Setting is spectacular. Service was excellent. A fantastic staff that does everything they can to make our stay great! Gail is amazing to work with. She's one of the reasons we keep coming back! She recommended a different house this year and it was one of our favorites! Absolutely best vacation! House was lovely - perfect layout, beautifully stocked kitchen, very nice linens. Pool, hot tub and ping pong table on top of being directly on the beach made it the perfect house for our family of 10. We rented bicycles for the entire week and rode the island. We will definitely be back!! Thanks for all your help getting us the perfect place. This was our 4th year booking with Destination Vacation. Your service has been great. Over the years I've talked to Gail, Jennifer and most recently Greg. They have always been helpful and answered any question I've had. Thank you all. This was our second stay at Dune 123 and have already booked it for 2017 so that speaks for itself. What a beautiful home. I could live in it wherever it was located but, of course, on the beach is best. It has everything we've ever needed. The storage is outstanding and we could never begin to fill all the cubbies. The second refrigerator is especially helpful. The master bath is quite nice and the kids love at least one bath in the jetted tub. We really like the big table for dinner and the small "canasta" table for cards in the window corner. The high ceiling and tall windows make the view to die for. The new tile around the pool is very pretty. We also like that there are always plenty of beach chairs and toys to use. The only addition I can think of would be a clock around the pool area, maybe on the wall behind the hot tub. Certainly not a deal breaker and not a complaint either! Thanks to the homeowners for making this lovely and comfortable home available to our family and thanks to Destination Vacation for your help in our planning. Our week vacation was perfect. The reservation process thru Destination was easy and Jennifer and Gale were extremely helpful with all questions we had. The few problems we encountered (hot tub and grill) were addressed quickly. We greatly appreciate your attention to these 2 matters and your quick fix, the new grill was great. 123 Dune Lane is a beautiful comfortable.home, this is the second time that we have stayed here and couldn't be more impressed with the decor, furnishings, well stocked kitchen, fluffy towels, amazing pool and deck area and of course the ocean view. Everything we could of wanted was provided. We had a wonderful time just hanging out on the beach and pool ( the new deck furniture was really nice). We also had a week of perfect weather. It was really nice to have the locked room downstairs (with the pool table) where previous renters left chairs, toys etc., knowing that there were toys, games and chairs that were available for us to use without having to purchase and leaving our items for the future renters was a plus. We will definitely rent this home again and we thank the owners for giving us the opportunity to stay in their lovely home. Stunning view from almost every room. Beautifully decorated. Well appointed with everything you could need to be comfortable, including grill, tons of utensils, ping pong table, blender, etc. Large living room with floor to ceiling Windows and a huge couch, Bedrooms were comfortable and there was plenty of closet space, Multiple bathrooms, including one by the pool, which was very convenient. Best part was waking up every morning to the sound of the ocean, and enjoying coffee on the deck. My teenage sons loved the pool and I enjoyed the hot tub at night, I recommend heating the pool before May or June, It made all the difference for us. This house is well maintained, super comfortable, beautifully decorated, and has an amazing location, on the beach and just one mile from Coligny Plaza, My kids enjoyed being able to have the freedom to bike to local shops and restaurants, We LOVED this house and have already reserved it again for next year. 123 Dune will be remembered!! Most of our grandchildren are old enough to keep this house in their memories. WE THOROUGHLY ENJOYED IT! It was perfect for the ages we have this year. And even though we had an infant along, someone could enjoy the pool area and view of the ocean while the baby napped. The service was wonderful. Prompt. THANK YOU. The home itself...ahhhh...beautiful. WE LOVED IT. My daughters-in-law are very observant about decor, furnishings, etc...and they really liked the home. We could not decide which was our favorite bedroom. But we ALL liked the living room-dining area- kitchen. And we would LOVE to visit again. We were there less than an hour when someone noticed the patio furniture from our town. Wonderful. Truly...it is difficult to find something negative. It was CLEAN, and had nearly anything we needed. We love grilling, so that was great too. Did we enjoy it? YES!!!!! The service we received from DV was excellent! Unfortunately, there was an issue that did not meet the quality standards we expected. I explained the issue to the DV staff, they contacted the owner and it was immediately addressed and resolved. Now that's customer service! Thanks again for how you handled this issue! The house was beautiful and roomy, with huge windows facing the ocean basically all the way across the entire back of the house. The bedrooms each had king beds with there own bathroom attached which was perfect for three couples! The large well equipped kitchen open to the family room made it easy to prepare meals while also still being engaged with the others hanging out or playing board games. The pool and hot tub were much enjoyed by those not wanting quite as much time in the sand down on the beach. The beach itself was large and never crowded. I ran for miles in each direction and we biked on the beach as well. It was very family oriented every where I went and I never saw or heard of anything questionable and never felt uneasy at all. It was a safe and comfortable environment. We would highly recommend this house, DV, and do plan on returning! The inside of the house has been redone and has a great amount of room for 10 people. The location is good, walking distance to both Palmetto Dunes and Coligny Square. Beautiful home, lots of space with open floor plan on main floor. Great for a large family, or a couple of families. We had an excellent week. Would definitely recommend this home. 123 Dune Lane is an amazing home. The decor and the comfort were perfect. Everything you would want or need was there for your use. You could not ask for better ocean views from all the rooms. The pool is large and the hot tub is great on those chilly evenings. Booking the home through Vacation Destination was a simple process and any questions or problems that we had were quickly resolved. We will be visiting again here soon. Our family has vacationed in Hilton Head the last 9 years. This was the first year we used Destination Vacation. The fact that we did not have to go to an office and pick up a key (or return one on the day we left) was very convenient. We booked this unit based on the outdoor space, but was pleasantly surprised when the owner redecorated. Having king size beds and many bathrooms was a huge plus. The best thing about this house was the pool. I spent 2 days at the pool and didn't even walk down to the beach. We sat outside on the pool deck every evening past dark. Lastly, the house was clean, the towels were heavy and nice, and the toiletries were first rate.